I stumbled upon this wonderful article entitled The Play Deficit. It reaffirmed my belief and determination to unschool and let my kids play. They learn so much through play even if I can't always see it, measure it or quantify it. One of my favorite quotes from the article "You can’t teach creativity; all you can do is let it blossom. Little children, before they start school, are naturally creative. Our greatest innovators, the ones we call geniuses, are those who somehow retain that childhood capacity, and build on it, right through adulthood." Wouldn't that be amazing??! If all our children could retain that creativity and keep building on it. Imagine all the possibilities! With only three days before Evan's big party weekend I had no intention of starting any school work until Monday anyway. The boys were pretty much left to play on their own. Our first day home from vacation they were happy to dig into their new toys and rediscover the joys of playing outside. Evan became Indiana Jones and used his whip, machete, and gun to battle the bad guys. They built their new Lego sets. Alec put together Agent P's hover craft and sent him on several assignments to beat Dr. Doofenshmirtz. They dug in the sand, played on the swings, built a waterfall and had lots of fun. They helped me get all of our grocery shopping done, wash and fold some clothes, and then we all went to the library. We listened to some more of Treasure Island while in the car and the boys were excited to put in the last CD, knowing the end of the book was near. Just as I was starting to panic that all this playing was wasting our time, Alec came to me asking me all sorts of questions about negative numbers, adding negative numbers together, adding negative and positive numbers together, etc. It seems he had been watching an episode of Cyberchase and was intrigued with this idea of negative numbers. I quickly drew up an impromptu number line and we discussed different ways to manipulate negative numbers, the times when we'd encounter negative numbers and how they are ordered. It was a great lesson and it was all self- guided. I sat back and thought-- "oh, so that's how unschooling works!" Yesterday, we once again, had a ton of things to do to get ready for this weekend so we headed out for some errands. The boys listened to the end of Treasure Island and are excited to watch the movie to compare the two. We went to the dollar store and Kmart to find the final supplies for the party. We picked apples and talked about the different types of apples, how they grow, why the apples are red and green, how cider is made, why it's so expensive and even talked about making our own apple pies and candy apples. 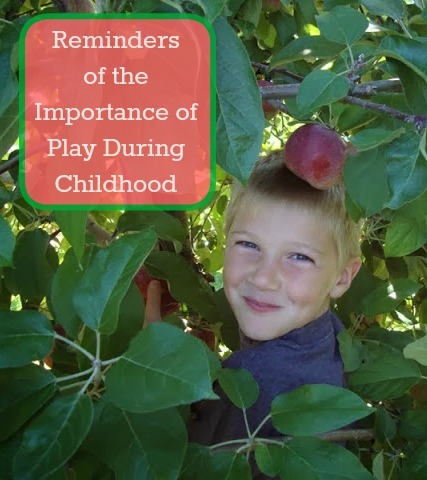 I'm sure we'll still throw in actual school lessons now and then and by mid- winter look much like traditional schooling but for now I am so happy to be reminded about the importance of play!